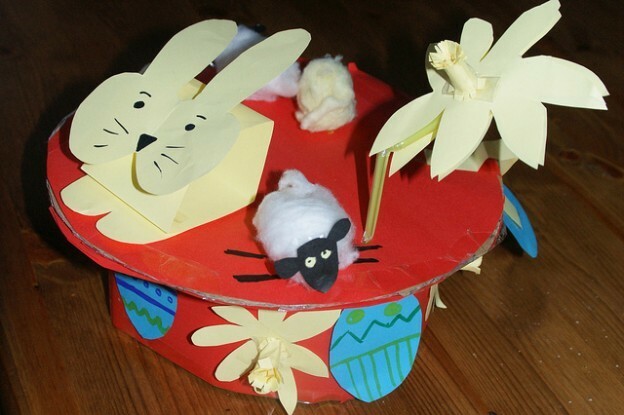 Children love making something they can wear, and at this time of year an Easter bonnet is a great choice. If you want to create a long-lasting bonnet, that could perhaps be added to a dressing-up box, then scour your local charity shops for a hat to use as a base. Provide a host of accessories for decoration, such as beads, fabric, coloured art foam, bright feathers etc, and let your little ones loose. For a speedy solution, a bonnet made from card or a paper plate is simple to make; check out this tutorial on Domestic Goddesque. And don’t think bonnets are only for girls! This gallery on Netmums has some exciting ideas for boys’ ‘bonnets’ as well. Of course, sweet delights, such as miniature nests made from breakfast cereal and chocolate, are the staple of Easter cooking, but why not stretch your culinary skills with some other treats? BBC Good Food has some super suggestions, including cress egg-heads, lollies with names, a selection of mini-cakes and biscuits for small appetites, muffins, hot cross buns and biscuits, and even egg-shaped chocolate truffles in an egg box. Recipes are easy to follow, and simple enough for youngsters to make with a little adult help. Many organisations, such as the National Trust, arrange special Easter Egg Hunts for children, but it can be great fun to plan your own. Even very young children can follow a hunt if you plan it well. For a basic hunt, draw a picture or take a digital photo of about ten places where you have hidden small eggs. Provide a tiny basket or bowl for collecting them, and set them hunting. For older children, try writing clues; if you are especially inventive you could even try making up short clues in verse! Or you could opt for a simple ‘hunt until you find them all’ approach using numbered stickers so children know when they’ve all been found. For a really inventive twist, use glow-in-the-dark stickers and hunt by torchlight the evening before! We all hope the weather will put on its best show for Easter, but if it lets us down, keep them occupied on a rainy day with some Easter printables. A quick internet search will reveal a vast range of printables, where sites such as Activity Village have downloadable examples such as colouring pages, cards, craft printables (e.g. Easter bunny), Easter bookmarks, Easter envelopes, lacing cards, and jigsaws etc. All you need is a printer and some coloured pencils, pens or paints. The holidays don’t need to be stressful if you plan ahead and think of some activities to do with your youngsters that they will enjoy. And you don’t need to break the bank taking them out either – sometimes activities at home are just as much fun. So have a Happy Easter holiday, and do leave a comment about your Easter activities! You are very welcome. Great tutorial!